Chimpanzees are well known for their extraordinary diversity of behaviors—including using tools for hunting or digging, cracking nuts with stones and using moss as a water-drawing sponge—with some behaviors also exhibiting cultural variation. An international research team led by the Max Planck Institute for Evolutionary Anthropology and the German Centre for Integrative Biodiversity Research recently investigated whether chimpanzee behavioral diversity is reduced when there is high human impact on their habitats—including development of human settlements and roads, poaching, agriculture and mining. San Diego Zoo Global’s Central Africa Program collaborated on the effort, which included field research sites where the conservation organization works. By comparing sets of chimpanzee behaviors across a large number of social groups exposed to different levels of human disturbance, the scientists found a reduction in behavioral diversity when human impact was high. The results of the study were published this week in the journal Science. “The fact that the study has found reduced chimpanzee behavioral diversity at sites where human impact was high may not be surprising, but [it is] extremely concerning,” said Bethan Morgan, Ph.D., head of San Diego Zoo Global’s Central Africa Program. “Given the increasing incidence of human habitat destruction and fragmentation across the remaining chimpanzee habitats in Africa, we need to actively conserve the remaining intact habitats as much as possible". Chimpanzees exhibit exceptionally high levels of behavioral diversity, compared to all other non-human species. This diversity has been documented in a variety of contexts, including the extraction of food resources, communication and thermoregulation. Many of these behaviors are assumed to be socially learned and group-specific, supporting the existence of chimpanzee cultures. As with all other great apes, chimpanzees have come under enormous pressure as a result of human activities, leading to a change of the natural environment. Their prime habitats, tropical rain forests and savanna woodlands, are increasingly being converted to agricultural farmland, plantations and settlements, or otherwise degraded by the extraction of natural resources and infrastructure development. Much of the empirical work and resulting debate on the loss of wildlife biodiversity has been conducted in the context of species decline or loss of genetic diversity and ecosystem functions. However, behavioral diversity is also a facet of biodiversity. Due to limited empirical data, until now it had been unclear whether behavioral diversity would similarly be negatively affected by human impact. The international research team compiled an unprecedented data set on 31 chimpanzee behaviors across 144 social groups or communities, located throughout the entire geographic range of wild chimpanzees. 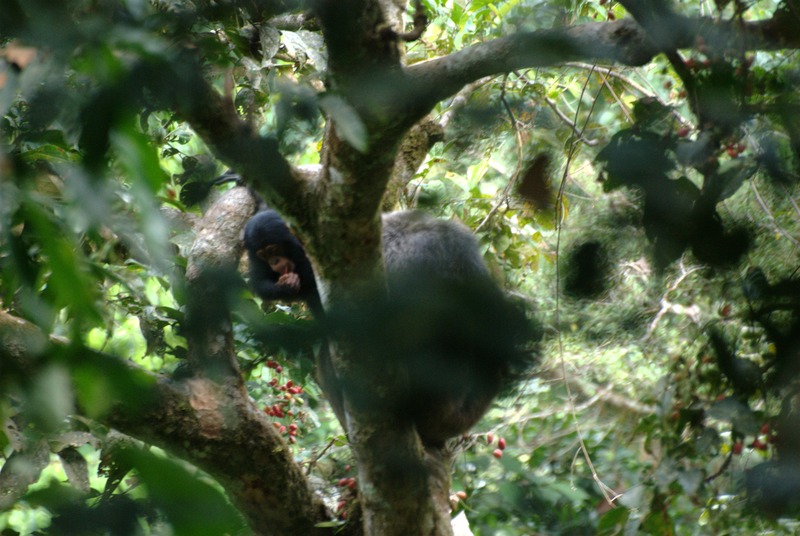 Although part of this information was already available in the scientific literature, the international research team also conducted extensive field work at 46 locations, as part of the Pan African Programme (http://panafrican.eva.mpg.de), across 15 chimpanzee range countries over the last nine years. The particular set of behaviors considered in this study included the extraction and consumption of termites, ants, algae, nuts and honey; the use of tools for hunting or digging for tubers; and the use of stones, pools and caves, among others. The occurrence of behaviors at a given site was investigated with respect to an aggregate measure of human impact. This measure integrates multiple levels of human impact—including human population density, roads, rivers and forest cover—all indicators for the level of disturbance and the degree of land cover change found in chimpanzee habitats. There are a number of potential mechanisms that may explain the loss of behaviors observed. As is known for humans, population size plays a major role in maintaining cultural traits and a similar mechanism may function in chimpanzees. Chimpanzees may also avoid conspicuous behaviors that inform hunters about their presence, such as nut cracking. Habitat degradation and resource depletion may also reduce opportunities for social learning, and thus prevent the transfer of local traditions from one generation to the next. In addition, climate change may be a factor, as it may influence the production of important food resources and make their availability unpredictable. It is likely that a combination of these potential mechanisms has caused the observed reduction in chimpanzee behavioral diversity. “Our findings suggest that strategies for the conservation of biodiversity should be extended to include the protection of animal behavioral diversity as well,” said Hjalmar S. Kühl, a lead author of the report. “Locations with exceptional sets of behaviors may be protected as chimpanzee cultural heritage sites, and this concept can be extended to other species with high degree of cultural variability as well, including orangutans, capuchin monkeys or whales.” These propositions are in accordance with existing biodiversity conservation efforts, such as the Convention on Biological Diversity or the Convention on the Conservation of Migratory Species of Wild Animals, of the United Nations Environment Programme, which calls for the protection of biological diversity in its entirety, including behavioral diversity of culturally rich wildlife.